I have owned this book for several years and used a few recipes out of it, but this year I have been canning and preserving an enormous amount of food. This is strange, as my own garden has been largely unproductive, but I seem to have inherited a huge amount of fruit and had some surplus produce from the local farmer who will deliver produce to our door. It is a nice problem to have. I have tried several of the recipes, including those for blood orange marmalade, apricot jam, plum jams, and crabapple jams. The descriptions of the whole canning and processing procedures are very clear, and the recipes have all turned out exactly as described. Very few of them use pectin, which some people seem to prefer avoiding. The only recipes that didn’t really work out for me were those using wine – the strawberry preserves in wine and the plum crabapple jam (wine variation) did not really set for me, and I cannot see where any errors were made. The strawberries are delicious but liquid – it is disappointing, as those were destined to be Christmas gifts. The plum crabapple jam turned out strangely – of the initial seven jars, two set and five did not. I reboiled the jam from the five unset jars, and ended up with four that set in the end. I would appreciate any advice, if there is any to be had. The book focuses on small batch preserving, which is helpful in term of learning how to can properly and in terms of storage space required. It also generally uses easily accessible ingredients, including a few that use dried fruit. This book has some lovely photographs, very clear directions, and includes additional recipes that use the canned goods that are produced using recipes earlier in the book. I have loaned this book to several friends, and each of them ended up buying their own copies for themselves and for gifts. 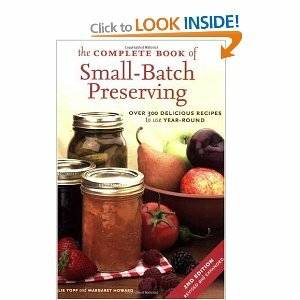 Small Batch Preserving is a very useful and well written book about preserving, and I highly recommend it to anyone interested in learning about preserving.